Library image #859: Hells Canyon National Recreation Area is part of the Wallowa-Whitman, Nez Perce, and Payette National Forests. The United States Congress designated the Hells Canyon Wilderness (map) in 1975 and it now has a total of 217,613 acres. Idaho contains approximately 86,276 acres. Oregon contains approximately 131,337 acres. It is managed by the Bureau of Land Management and the Forest Service. Hells Canyon Wilderness is a subset of the Hells Canyon National Recreation Area (HCNRA), which straddles the border of northeastern Oregon and western Idaho. Split into two distinct halves by the Wild & Scenic Snake River, approximately one-third of HCNRA comprises the Hells Canyon Wilderness. A small portion of the Wilderness in Oregon is managed by the BLM. The Idaho side of the Wilderness is smaller than the Oregon side and encompasses the Seven Devils mountain range. The Wilderness stretches south from Pittsburg Landing for approximately 31 miles along the Snake River. In the summer, the temperature at the river often reaches 110 degrees F. After May, hiking in the canyon is very difficult due to heat. Even so, in early June the Seven Devil Mountains on the Idaho side are often still under five feet of snow. On the Oregon side, the higher elevation areas are characteristic of rocky slopes and grasslands laced with 'stringer canyons' and groves composed of Douglas fir and ponderosa pine. The lower elevations are dominated by grassland benches with steep canyons and ravines dissecting the isolated Oregon-side. Hells Canyon is 8,000 feet deep in places. The average depth is more like a mile – 5,280 feet. At any rate, it is 9,393 feet elevation at He Devil Mountain in the Hells Canyon Wilderness of Idaho, and from 1,000 to 800 feet down on the river. Two National trails are found at various elevations: Western Rim/Summit Ridge Recreation Trail at the upper elevation, and Nez Perce Historic Trail near the Snake River. 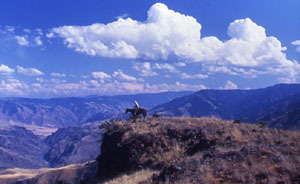 In total, Hells Canyon Wilderness contains 360 miles of trails. Species of interest are Rocky Mountain Elk, bighorn sheep, mule deer, and chukar. Plant species include sagebrush, Engelmann spruce, sub-alpine fir, western larch, Douglas fir, and ponderosa pine. Prickly pear cactus and poison ivy are fairly common as well. Planning to Visit the Hells Canyon Wilderness? How to follow the seven standard Leave No Trace principles differs in different parts of the country (desert vs. Rocky Mountains). Click on any of the principles listed below to learn more about how they apply in the Hells Canyon Wilderness.